Pyroshock testing is an important part of the design and certification processes for military contractors, aerospace manufacturers and other organizations. To meet these requirements, NTS offers a variety of pyroshock testing services. Pyroshock refers to any long-term, high-frequency and high amplitude mechanical excitation. Pyroshock exposure can damage circuit boards, dislodge contaminants, short out electrical components or cause other negative consequences. Pyrotechnic shocks are usually detailed in terms of a Shock Response Spectra (SRS) and are expressed in terms of acceleration (g or m/s2) and natural frequency (fn). NTS can produce true pyrotechnic shock using shaped charges or primer cord generating accelerations to 100,000g (980,000 m/s2), and frequencies of 100 Hz to 10,000 Hz. Electrodynamic exciters used for Pyroshock simulation can accept loads of up to 1000 lbs. and produce peak shock spectra up to 4000g. Shock spectra can be controlled with octave equalization. Examples of components that might experience this shock environment include devices used in satellites and launch vehicles, as stage separation and satellite ejection often involve pyrotechnic events (e.g., explosive bolts). A second group of components requiring pyroshock testing may be those mounted in close proximity to the event or mounted on the skin of structures, such as brackets, sensors, cameras and other equipment. Near-field —Near-field pyroshock testing is accomplished via a mechanical or a pyrotechnically excited simulation. This type of testing is typically employed for amplitudes above 10,000 g and frequencies of 10 kHz or higher. Mid-field — Mid-field testing refers to any testing involving frequencies between 3-10 kHz and amplitudes up to 10,000 g. Simulation can be done mechanically by any means other than shaker shock testing. Far-field — Lastly, far-field testing encompasses pyrotesting of amplitudes up to 1,000 g at frequencies less than 3 kHz. This is the only type of pyroshock testing for which shaker shock testing is applicable, though mechanical simulation is also an option. These categories are further defined in MIL-STD-810G, Method 517, and NASA-STD-7003 standards. For more information about various testing options, contact an NTS representative today. 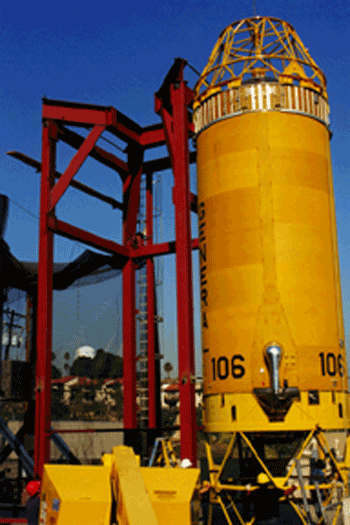 NTS has been performing pyroshock testing and other related services for more than 50 years. We maintain multiple laboratories across the country, where we can quickly respond to your requests and provide a fast turnaround for your project. Each of our facilities has been fully accredited by the American Association for Laboratory Accreditation (A2LA), the Defense Logistics Agency and other relevant certifying bodies. Our accreditations ensure that any pyroshock testing we complete meets the highest standards for accuracy, and maintains your compliance with the appropriate ISO, MIL and other standards. With high-energy test events such as pyroshock, NTS is able to advise our clients of the best sequencing with other testing (such as vibration, temperature cycling, etc.). We also welcome clients witnessing their tests, and we carefully monitor the performance of accelerometers and other instrumentation for accurate one-time data download. Contact us today to discuss your pyroshock testing needs.